Network engineers from Puerto Rico’s broadband providers met for several days this week at the Telegrafo facilities in Santurce for the “2013 IPv6 Summit for Broadband Network Operators,” to begin preparations for Puerto Rico’s transition to IPv6 – the next generation Internet Protocol. 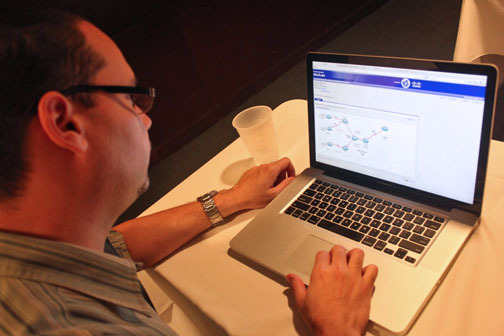 The activity was sponsored by the Puerto Rico Bridge Initiative, PRBI, and Cisco Systems, and included three days of technical training for network engineers by Cisco’s IPv6 expert Jorge Alonso Ayala. The topics addressed included IPv6 provisioning, transition, routing and migration issues faced by broadband service providers. In attendance were Network Engineers and representatives from broadband providers including AT&T, Claro, OSNet, Caribe.Net, Prepa.Net, Choice, Open Mobile, T-Mobile, Worldnet, Xecure Networks, WIFI Caribbean, as well as representatives from the University of Puerto Rico, Senate of Puerto Rico and the Office of Budget & Management (OGP). Internet Protocol, a.k.a. IP, is the language, which is used for data communications on the Internet. IPv6 is the successor to the currently used IPv4. Due to the explosive worldwide growth of the Internet, IPv6 adoption is essential to ensure the continued growth of the Internet. The major difference between IPv4 and IPv4 is the number of IP addresses. There are just over 4 billion IPv4 addresses (232), while there are 2128 IPv6 addresses, or in other words, IPv6 can support 340,000,000,000,000,000,000,000,000,000,000,000,000 devices. In April 2010, Critical Hub was awarded $25.7 million in ARRA funds through the NTIA for the creation of the PRBI, a project designed to bring fast, affordable broadband service to all of Puerto Rico. The company has developed several projects and has worked with nonprofits and government to expedite the availability of high-speed Internet throughout the island. Hey Buddy!, I found this information for you: "Puerto Rico tech execs mark 1st anniversary of ‘World IPv6 Day’". Here is the website link: https://newsismybusiness.com/puerto-rico-tech-execs-mark-1st-anniversary-of-world-ipv6-day/. Thank you.